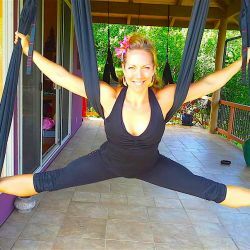 Why did I create Aerial Yoga Play? Optimal Performance. To share with you effective ways to gain Optimal Radiant Health & live in Optimal Performance with my being. Regenerative Therapeutix. To understand the Regenerative nature the body and share with you a Therapeutix practice that works. Alignment. Coming into centered, balanced strength with my Source is always my highest goal. Bring more JOY into our lives. 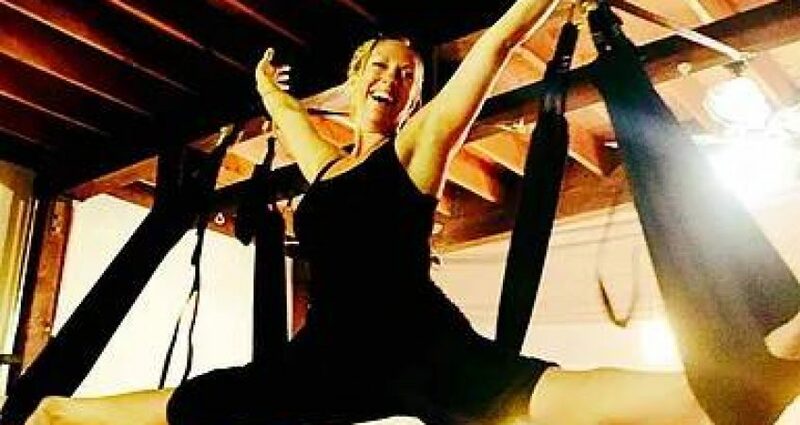 Aerial Yoga Play is a Therapeutix practice designed to open, align, and release tension in the body (and the spine) to allow the natural flow of energy for optimal health. This is designed to be fun and playful yet effective. This program is for EVERYONE. It is all levels. No matter what age, experience level or shape you are in. 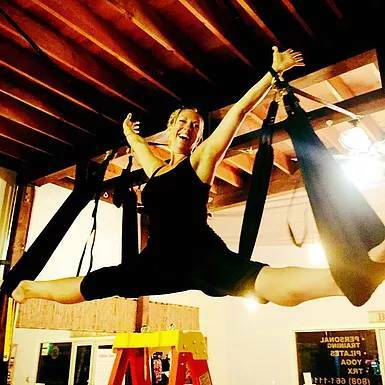 Don’t be intimated by the “Aerial” part, it just means suspended by the very comfortable yoga swing. We are actually touching the ground with one part of the body most of the time. 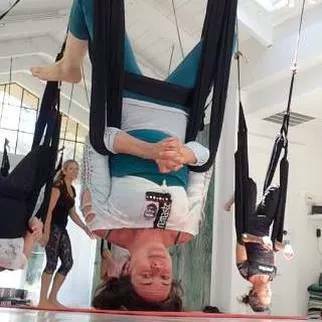 The new version called AYRx (Aerial Yoga Play + Rx Version) will be a more accurate name for the modality developed as part of a larger comprehensive Healyng program for Optimal Performance. I’ve heard many people reflect on 2016 lately with an air of angst/frustration because of how challenged they’ve felt. It is quite understandable under the current conditions to have lost that sense of joy and wonder that makes the holiday season and the new year so magical. It reminded me to look back on what my intention was for 2016: JOY. The past year has taught me that it’s 100% necessary to not only find Joy, but to tap into that infinite source of unconditional Joy. We could almost call it Radical Joy under these trying times. I actually really en-joy the winter season as an opportunity to pause and take the time to look back on the experiences that have molded my year. What I have learned this year in living my dedication to creating more Joy [for myself and others] is that many circumstances may not bring me joy, but I can always bring more joy to any situation. This insight seems so simple, yet what I’ve noticed is that, for most people, when things are going “well,” they are happy, and when things get rough, they are sad. We are living a very conditional life. There’s nothing wrong with that, and it sure is “normal” for most people to live this way, but it certainly doesn’t bring much joy to our lives, at least not consistently. So, my dedication for 2017 is to practice finding the inherent well of joy that springs up from the core of my being, not attached to anything, not for any particular reason– just ’cause I’m alive, in a lovely body, and able to breathe fresh air. It is a practice that brings us back to our center, that alignment with something greater than circumstance, and beyond our environment to a deeper understanding of connection, of clarity, of grace & ease. I am constantly inspired to find more creative ways to bring greater joy to my world and yours; even when times get tough and require us to grow, we can turn that frown upside down, and find a reason to appreciate and en-joy this opportunity to be alive. To many more beautiful moments together… may your heart know peace, may your mind know love. In-joy.